Read this report to learn how running a business on older servers impacts productivity and profitability and how successful organizations keep their server infrastructure up-to-date to make gains in productivity and profitability. Businesses today rely on their server infrastructure to drive productivity, keep their data secure and available, and ensure that both critical and everyday applications are up and running. 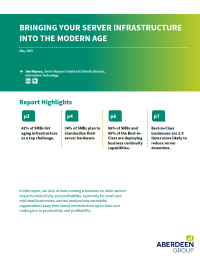 Many SMBs, however, view aging infrastructure as a top challenge. Successful organizations keep their server infrastructure up-to-date for greater application performance and reliability.